61% support a wealth tax on households that have a net worth of at least $50 million, as championed by Warren. 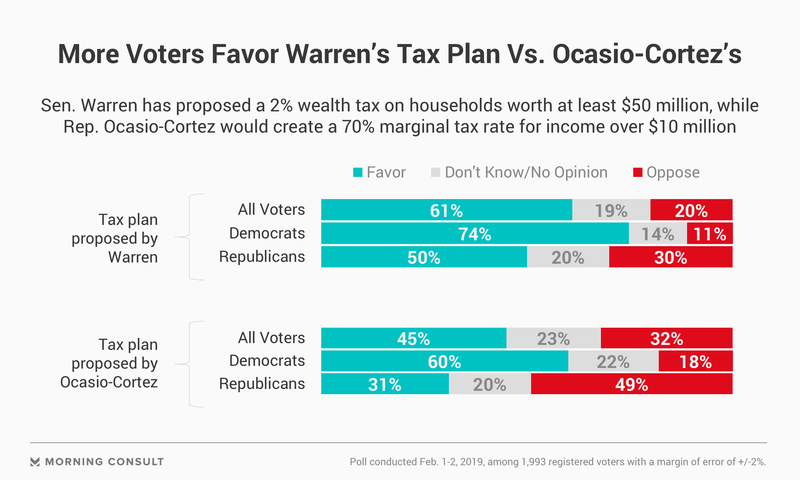 45% support Ocasio-Cortez’s proposed 70% marginal tax rate on income over $10 million. Warren’s tax plan also fared better with Democrats: 74 percent favored it compared to 60 percent for Ocasio-Cortez’s proposal. The senator’s proposal also drew support from half of the Republican voters in the survey. By contrast, nearly half of Republicans (49 percent) opposed the idea of a 70 percent marginal tax rate. Sen. Bernie Sanders (I-Vt.) also recently joined the group of progressive politicians calling for ways to tax the country’s wealthiest. The possible 2020 presidential hopeful proposed an estate tax for those leaving assets of more than $3.5 million, significantly lowering the threshold from where it currently stands at $11 million. All three lawmakers are tapping into a widespread perception that wealthier people don’t pay their fair share of taxes. When asked if upper-income people pay too little, too much or the right amount in taxes, 63 percent of voters said that group pays too little. Those who felt that way include 78 percent of Democrats and a plurality of 46 percent of Republicans.